Aug. 28 (Bloomberg) -- Crude oil was little changed near $73 a barrel after rising yesterday as equity gains lifted investor sentiment and the dollar weakened, boosting the appeal of commodities as a hedge against inflation. Equities advanced as American International Group Inc. led U.S. financial stocks higher and Boeing said the 787 Dreamliner will make its first flight this year. Those gains helped oil rebound from as low as $69.83 yesterday. Crude oil for October delivery gained 10 cents to $72.59 a barrel on the New York Mercantile Exchange at 9:03 a.m. Sydney time. Yesterday, the contract rose $1.06, or 1.5 percent, to settle at $72.49. Futures are 2.3 percent lower for the week. The Standard & Poor’s 500 Index added 2.86 points and the Dow Jones Industrial Average advanced 37.11 to 9,580.63, rallying for the eighth straight day. The euro traded at $1.4346 at 6:09 a.m. in Tokyo, following a 0.6 percent gain yesterday. A report showing that the U.S. economy contracted less than anticipated in the second quarter amid a jump in government spending and smaller cutbacks by consumers also supported oil prices. The total number of people collecting unemployment insurance fell to the lowest level since April, in a sign that the economy is pulling out of the recession. Brent crude for October rose 86 cents, or 1.2 percent, to $72.51 a barrel on the London ICE Futures Europe Exchange. Aug. 28 (Bloomberg) -- The dollar fell against the euro, capping a two-month drop, as a rebound in crude oil and stocks reduced demand for the relative safety of the U.S. currency. The greenback weakened for a second day against the 16- nation currency before a report forecast to show a gauge of consumer confidence in the U.S. rose this month, adding to evidence that the recession is easing. The dollar traded at $1.4368 per euro at 8:39 a.m. in Tokyo from $1.4341 yesterday in New York. The dollar bought 93.63 yen from 93.52 yesterday when it touched 93.22, the lowest level since July 22. The euro was at 134.53 yen from 134.14 yesterday. The European currency reached the most in almost three weeks at $1.4406 yesterday as the Standard & Poor’s 500 Index added 0.3 percent after earlier dropping as much as 1.2 percent. The $1.4280 level was significant because that’s where the euro resumed declines on Aug. 26 after trying to overcome a previous loss, said Andrew Chaveriat, a currency strategist at BNP Paribas SA in New York. Traders typically place so-called stop losses at key levels to protect themselves when a bet moves in the opposite direction. The Dollar Index, which IntercontinentalExchange Inc. uses to track the greenback against the currencies of six major U.S. trading partners, dropped as much as 1 percent to 77.851 yesterday, the biggest intraday decrease since Aug. 3. A Bloomberg News survey of economists showed that the Reuters/University of Michigan gauge on Aug. 28 is projected to rise. The barometer of confidence among U.S. consumers probably rose to 64.0 in August from 63.2 in the previous month. Adding to signs that the recession is easing, the world’s largest economy contracted less than economists forecast as companies reduced inventories, spending started to climb and profits grew, a Commerce Department report said yesterday. Gross domestic product shrank 1 percent in the three months ended in June, matching the initial estimate on July 31. The contraction was less than the 1.5 percent median forecast in a Bloomberg News survey of 75 economists. Canada’s currency advanced as much as 1.3 percent to C$1.0832 versus its U.S. counterpart yesterday in the biggest intraday climb since Aug. 12. Oil generates more than half of Canada’s export revenue. Crude oil for October delivery rose 1.2 percent to $72.25 a barrel on the New York Mercantile Exchange after losing as much as 2.2 percent. The yen fell after reports today showed Japan’s unemployment rate rose to a record 5.7 percent in July, while consumer prices dropped at an unprecedented 2.2 percent. FKLI Aug Futures contract rose 4.5 points higher to close at 1173.5 levels as compare to previous trading session to with a total of 5,279 lots traded in the market. 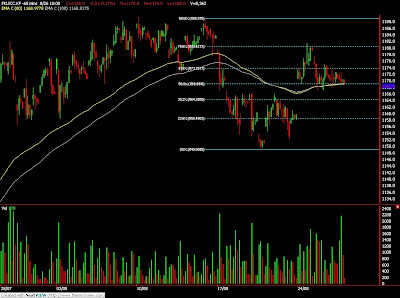 FKLI was traded sideways despite most of the regional indices were traded weak during trading session. Technically, FKLI supported above 1167 levels and 80 – day, 100 – day exponential moving average in the hourly and 15 minute price chart. Based on our technical view, our opinion suggests FKLI is possible to rebound where resistances levels were seen at 1176 and 1182 regions. 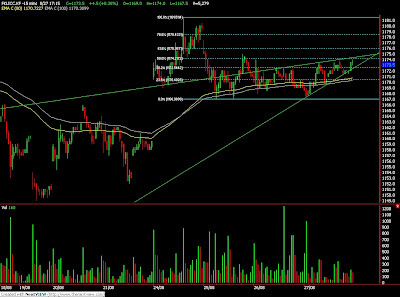 Traders were advice to hold short position provided resistance levels were not violated while be alert around supports at 1167 and 1160.5 levels. CPO 3rd month Nov futures contract lose RM11as compare to previous trading sessions to close at RM2346 with a total of 7,488 lots traded in the market. CPO price was traded sideways as crude oil and soybean oil electronic trading were traded quiet as lack of fresh market leads that drives market to react. Yeon Sziang: while be cautious around support levels at RM2331 and RM2300 regions. Aug. 26 (Bloomberg) -- Gold and silver futures fell as the dollar’s rebound reduced the appeal of commodities as alternative investments. The dollar climbed as much as 0.6 percent against the euro after the Xinhua News Agency reported that China is studying curbs on industrial overcapacity, increasing concern the global recovery will slow. The Reuters/Jefferies CRB Index of 19 raw materials fell as much as 0.8 percent, and crude oil dropped. “If the dollar continues to strengthen and oil falls, gold could correct toward $930 an ounce,” said Sagiv Peretz, a senior dealer at Finotec Trading U.K. in London. Gold futures for December delivery slid 20 cents to $945.80 an ounce on the Comex division of the New York Mercantile Exchange. Earlier, the price dropped as much as 0.5 percent. Bullion for immediate delivery rose $1.18 to $945.93 at 3:27 p.m. New York time. U.S. government figures showed today that purchases of new homes jumped more than forecast in July and demand for long- lasting goods such as autos and computers climbed, reinforcing signs the economy is rebounding. A “stronger dollar following home-sales data and durable- goods orders” pushed gold lower, Jon Nadler, a senior analyst at Kitco Inc. in Montreal, said in an e-mail. The metal may fall to $935, he said. Yesterday, holdings in the SPDR Gold Trust, the biggest exchange-traded fund backed by the metal, fell 4.58 metric tons to 1,061.83 tons, the lowest level since March 13. Silver futures for December delivery fell 5.8 cents, or 0.4 percent, to $14.288 an ounce on the Comex. Gold has climbed 7 percent this year, while silver is up 27 percent. Aug. 27 (Bloomberg) -- The dollar advanced for a fourth day against the euro amid concern restrictions on Chinese production will stifle an economic recovery and as regional shares fell, sparking demand for safe-haven currencies. The yen rose versus all of its 16 most-active counterparts as risk appetite waned before reports this week forecast to show Japan’s unemployment rate matched a record high and the U.S. economy contracted at a faster pace than initially projected. The Australian dollar sank for a third day against the greenback after crude oil fell, undermining demand for the currencies of commodity producers. The dollar traded at $1.4232 versus the euro at 9:38 a.m. in Tokyo from $1.4255 yesterday in New York. The yen was at 133.74 per euro from 134.36. The dollar weakened to 93.98 yen from 94.26 yesterday. The Australian currency was at 82.59 U.S. cents from 82.84 cents. Crude oil, the nation’s fourth-most valuable export, fell for a third day to $71.17 a barrel. China’s cabinet said yesterday it’s studying restrictions on overcapacity in industries including steel and cement as policy makers seek to rein in investment growth fueled by a record credit expansion this year. The Chinese government will also increase “guidance” over parts of the coal, glass and power industries, the State Council said on its Web site yesterday. Controls on stock and bond sales by companies in targeted sectors will be strengthened, it said. The nation’s benchmark stock index has dropped 15 percent from its Aug. 4 high this year on concern banks may tighten credit after extending a record $1.1 trillion of loans in the first six months. The Nikkei 225 Stock Average fell 0.8 percent today and the MSCI Asia Pacific Index of regional shares lost 0.3 percent. The yen advanced for a third day against the euro as a Bloomberg News survey of economists showed the unemployment rate in Japan rose last month, sapping risk appetite. The rate is forecast to match a record high of 5.5 percent. Consumer prices excluding fresh food dropped an unprecedented 2.2 percent in July, according to a separate survey. Both reports are due tomorrow. Adding to concerns that a global recovery will be slow, the U.S. government’s revised figures for second-quarter gross domestic product, due today, may show the economy contracted at a 1.5 percent annual rate, compared with the preliminary showing of a 1 percent fall, according to a Bloomberg News survey. The pound extended its drop for seventh day versus the euro, the longest stretch of losses since January this year, before a report forecast to show U.K. house prices increased at a slower pace this month. The average cost of a home climbed 0.5 percent this month following a 1.3 percent rise in July, according to a Bloomberg News survey of economists before the Nationwide Building Society releases the data today. CPO 3rd month Nov futures contract close marginally RM2 higher as compare to previous trading sessions to close at RM2357 with a total of 9,427 lots traded in the market. CPO price was traded wild to find support and resistance regions as crude oil and soybean oil electronic trading were traded both directions. Technically, CPO price surprised us by testing higher resistance levels at 78.6% at RM2385 regions despite previously manage to hit 61.8% Fibonacci levels at RM2362 regions. Based on our technical point of view, our opinion suggests CPO price still riding a bearish phase where support levels seen at RM2300 and RM2270 regions. Traders were advice to hold short position in the coming trading session but be cautious around resistance levels at RM2385 and RM2411 regions. FKLI Aug Futures contract fall marginally 2 points lower to close at 1169 levels as compare to previous trading session to with a total of 8,362 lots traded in the market. FKLI were mainly traded sideways despite regional indices and Dow Jones electronic trading were trading near the high side during the trading sessions. Technically, FKLI seems traded above 80 – day and 100 day exponential moving average on 1168 levels in hourly and 15 minute price chart. Based on our technical interpretation, our opinions suggest FKLI were considered bearish unless resistance levels at 1176 and 1181were not violated. 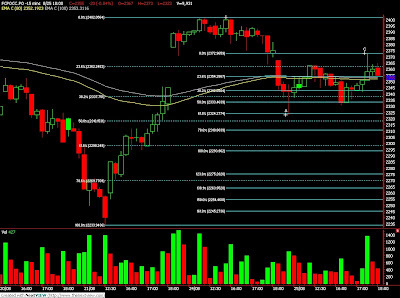 Traders were advice to hold short position while be cautious around supports at 1167 and 1160.5 level. Aug. 26 (Bloomberg) -- The yen rose for a second day against the euro amid concern financial losses will delay a recovery in the global economy, boosting demand for Japan’s currency as a refuge. The yen advanced against all 16-major currencies after White House budget chief Peter Orszag said U.S. unemployment will surge to 10 percent this year. Reuters reported today that Colonial BancGroup Inc., the parent of the Alabama lender taken over by BB&T Corp., filed for Chapter 11 bankruptcy. The yen rallied to 134.41 per euro as of 9:16 a.m. in Tokyo from 134.65 yesterday in New York. The Japanese currency traded at 94.08 per dollar from 94.18 yesterday. The dollar was at $1.4289 per euro from $1.4296 yesterday. Japan’s export slump deepened in July, indicating the boost in demand that helped pull the country out of its recession last quarter may be short-lived. Shipments abroad fell 36.5 percent from a year earlier, steeper than June’s 35.7 percent drop, the Finance Ministry said today in Tokyo. FKLI Aug Futures contract fall 8.5 points lower to close at 1171 levels as compare to previous trading session to with a total of 7,839 lots traded in the market. FKLI traded lower as regional indices were traded weak but manage to cover some losses before market closed. 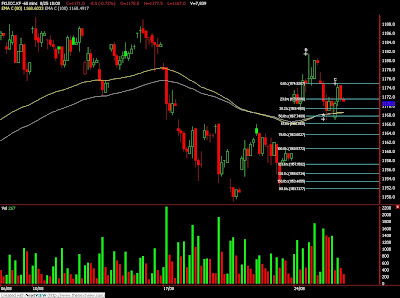 Technically, FKLI seems unable to breach resistance levels at 1180.5; 78.6% Fibonacci retrace levels and manage to rebound 50% Fibonacci retrace levels after found support at 1177 levels. Based on our technical view, our opinion suggests FKLI would plunge provided resistance levels at 1176 and 1182 were not violated during trading session. 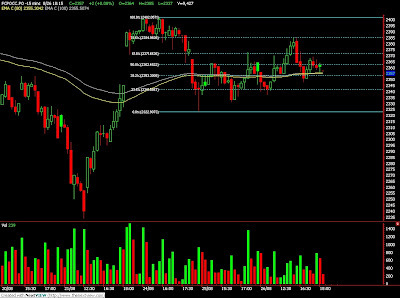 Traders were advice to hold short position in the coming trading session while be cautious around support at 1167 and 1160.5 levels. CPO 3rd month Nov futures contract close RM20 lower as compare to previous trading sessions to close at RM2355 with a total of 9,931 lots traded in the market. CPO price seems traded lower during trading session as crude oil and soybean oil were traded weak but CPO manage to recover some losses before market ended. Technically, CPO price manage to rebound 61.8% Fibonacci retrace levels at RM2372 regions and manage to cover overnight gap in the hourly chart and daily chart. Based on our technical view, our opinion suggests CPO would trade lower in the coming trading session provided resistance levels at RM2372 and RM2390 were not violated. Traders were advice to hold short position in the coming trading session while be cautious around support levels at RM2300 and RM2272 regions. Aug. 25 (Bloomberg) -- Palm oil futures dropped on concern that demand is slowing as the industry heads into the highest production months. Malaysian production gained 3 percent to 1.49 million metric tons in July, a fifth month of expansion, the Malaysian Palm Oil Board said Aug. 10. For the first 25 days of August, exports fell 10 percent to about 1 million tons, compared with the same period the previous month, independent surveyor Intertek said today. “The industry could see some downward action in the nearer term as we go into the high production season,” said an ECMLibra Research report, saying prices may average 2,300 ringgit ($654) a ton this year. The commodity has averaged 2,198 ringgit this year. Palm oil for November delivery dropped as much as 2.2 percent to 2,323 ringgit a ton and last traded at 2,352 ringgit at 11:44 a.m. on the Malaysia Derivatives Exchange. Indonesia and Malaysia account for 90 percent of world palm oil output. Typically, oil palms produce 55 percent of annual production in the second half. Still, contracts for delivery in 2010 are poised to rise, ECMLibra said. The commodity has gained 38 percent this year amid speculation drought damage to soybean crops in Argentina, Brazil and India would increase the appeal of palm oil, which is a direct substitute for soybean oil. “Our study suggests that with production coming in soft for the rest of the year and exports maintaining levels which are about 5 to 10 percent higher than 2008, the next production down-cycle could see the industry in a supply shortage situation,” ECMLibra said of the demand-supply outlook. Oil-palm yield typically slows at the end of the year and drops in the first quarter. “This would inadvertently bring prices closer to the 3,000 ringgit level,” the report said. Soybeans for November delivery in Chicago dropped 0.8 percent to $9.99 a bushel in after-hours trading. December- delivery soybean oil dropped 0.6 percent to 37.5 cents a pound, making it 24 percent more expensive than palm oil, according to Bloomberg data. Aug. 24 (Bloomberg) -- Gold declined the most in a week as the dollar climbed, eroding the metal’s appeal as an alternative investment. Silver futures gained. The greenback rose against a basket of six major currencies, halting a four-session slide. Gold gained 0.6 percent last week, while the dollar declined 1.1 percent. “The market is likely to retreat toward $925 to $930 an ounce, provided the dollar rebounds from current lows,” Andrey Kryuchenkov, a VTB Capital analyst in London, said in a note. Gold futures for December delivery slipped $11, or 1.2 percent, to $943.70 an ounce on the Comex division of the New York Mercantile Exchange. The drop was the biggest since Aug. 17. Bullion for immediate delivery fell $10.72, or 1.1 percent, to $943.13 at 2:43 p.m. New York time. Hedge-fund managers and other large speculators reduced their net-long position in New York gold futures by 6.6 percent in the week ended Aug. 18, according to U.S. Commodity Futures Trading Commission data. Speculative long positions, or bets that prices will rise, outnumbered short positions by 177,530 contracts. “Unless the gold market receives fresh news on the bullish front, the risk of easing back toward $925 remains reasonably present,” Jon Nadler, a senior analyst at Kitco Inc. in Montreal, said in a note. Holdings in the SPDR Gold Trust, the biggest exchange- traded fund backed by the metal, rose 0.92 metric ton to 1,066.41 tons on Aug. 21, the first increase since July 16. The fund reached a record 1,134.03 tons on June 1. The worldwide economy is pulling out of recession, Federal Reserve Chairman Ben S. Bernanke and European Central Bank President Jean-Claude Trichet said last week at the annual central bankers’ symposium in Jackson Hole, Wyoming. “Hopes for an improvement in the economy and fears regarding the emergence of inflation are leading to higher commodity prices,” GoldCore Ltd., a brokerage in Dublin, said in a note today. An economic rebound may buoy prices of silver, which has more industrial uses than gold. Silver futures for December delivery rose 3.2 cents, or 0.2 percent, to $14.231 an ounce. The metal has gained 26 percent this year, while gold is up 6.7 percent. Aug. 25 (Bloomberg) -- Crude oil dropped from a 10-month high after U.S. equities slipped and the dollar strengthened, reducing the appeal of commodities to investors. Most U.S. stocks fell, led by financial companies, after SunTrust Banks Inc. said lenders face more credit losses and commercial real estate may falter through 2010. Oil also declined as investors sought so-called safe-haven currencies such as the dollar in the face of weaker equities. Crude oil for October delivery dropped 49 cents, or 0.66 percent, to $73.88 a barrel on the New York Mercantile Exchange at 9:37 a.m. in Sydney. Yesterday, the contract rose 48 cents to settle at $74.37 after touching $74.81, the highest since Oct. 21. Futures have gained 66 percent in 2009. The U.S. currency traded at $1.4304 per euro at 6:05 a.m. in Tokyo, after a 0.2 percent gain yesterday. A stronger dollar limits investors’ need for assets to hedge against inflation such as commodities. “Downward pressure could come from a pull back in equities” and increases in U.S. crude supplies, Sander said. Shares of Japanese and Australian companies traded in New York declined after a gauge of Asian equities posted the steepest rally in more than three months, fanning concern that prices exceed the prospects for company earnings. The Bank of New York Mellon Japan ADR Price Index, which tracks American depositary receipts of Japanese companies, fell 0.3 percent, its first drop in five sessions. Australia’s S&P/ASX 200 Index futures contract due in September fell 0.5 percent today. Six stocks fell for every five that rose on the New York Stock Exchange. The Standard & Poor’s 500 Index dropped 0.1 percent and the Dow Jones Industrial Average added 3.32 points, or less than 0.1 percent. Brent crude oil for October settlement rose 7 cents to close at $74.26 a barrel on the London-based ICE Futures Europe exchange yesterday. Aug. 25 (Bloomberg) -- The yen advanced against the euro after Asian stocks fell on renewed concerns that the U.S. financial crisis will linger, reviving demand for so-called safe-haven currencies. The yen rose to 134.70 per euro as of 9:41 a.m. in Tokyo from 135.27 in New York yesterday. Japan’s currency traded at 94.22 yen per dollar from 94.56. The U.S. currency was at $1.4292 per euro from $1.4304. FKLI Aug Futures contract surge 20 points higher to close at 1179.5 levels as compare to previous trading session to with a total of 8,195 lots traded in the market. FKLI rebound higher as regional indices and Dow Jones overnight plus electronic trading were traded high during trading session. 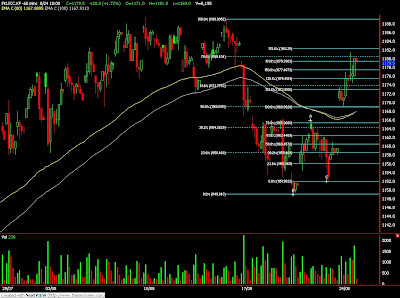 Technically, FKLI manage to rebound 78.6% Fibonacci retrace levels at 1180.5 with 178.6% Fibonacci projection levels at1182 regions. Based on our technical view, our opinion suggest FKLI would plunge in the coming trading session provided resistance levels at 1180.5 and 1190 must not be violated. 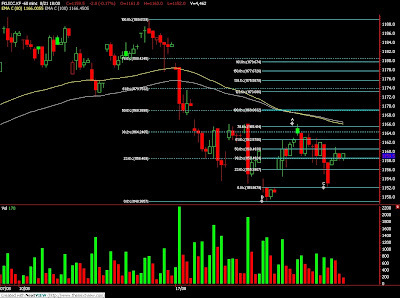 Traders were advice to hold short position in the coming trading session while support levels were seen at 1174.5 and 1169. CPO 3rd month Nov futures contract close RM30 higher as compare to previous trading sessions to close at RM2375 with a total of 12,761 lots traded in the market. CPO price was mainly traded within narrow range as crude oil and soybean oil electronic were not actively traded while CPO awaiting for coming export figure. Technically, CPO formed top side consolidation around RM2400 and RM2385 regions before manage to break lower to test 1st support level at RM2363; 23.6% Fibonacci retrace levels. Based on our technical view, our opinion suggest CPO price would retrace to form wave B in the coming trading session with support levels seen at RM2337 and RM2298. Traders were advice to hold short position in the coming trading session provided resistance levels at RM2411 and RM2450 were not violated in the coming trading session. Aug. 24 (Bloomberg) -- Gold, little changed in Asian trading, may decline after the biggest rally in three weeks spurred investors to sell the precious metal. Bullion typically moves inversely to the dollar and gained 1.4 percent on Aug. 21 as a decline in the Dollar Index, a six- currency gauge of the greenback’s value, increased the metal’s appeal as a hedge against inflation. The Index, along with rising stocks, may provide support to gold, said Hwang Il Doo, a trader with KEB Futures Co.
Gold for immediate delivery dropped 30 cents to $953.55 an ounce at 9:13 a.m. in Singapore. The Dollar Index lost 0.1 percent to 77.987, while the MSCI Asia Pacific Index of regional shares jumped 2.1 percent. Gold holdings in the SPDR Gold Trust, the biggest exchange- traded fund backed by bullion, added 0.9 metric tons to 1,066.41 tons as of Aug. 21, expanding for the first time since July 16, according to figures on the company’s Web site. Among other precious metals for immediate delivery, silver advanced 1 percent to $14.32 an ounce, platinum gained 0.3 percent to $1,260 an ounce and palladium added 0.9 percent to $283.50 as of 9:19 a.m. in Singapore. Aug. 24 (Bloomberg) -- Soybean futures gained for a second day, jumping as much as 2.5 percent, after the dollar weakened and the Professional Farmers of America said U.S. harvests may be smaller than expected. The dollar weakened against most major currencies, making U.S. supplies cheaper for importers. Pro Farmer’s survey last week of soybean fields in the world’s biggest grower and exporter forecast output will be 3.15 billion bushels, less than the government estimate of 3.199 billion bushels. “The weaker U.S. dollar at the moment is what the market is focusing on,” Jonathan Barratt, managing director at Commodity Broking Services Pty. in Sydney, said by phone today. Weather-related crop damage will “add some support and we should see the market up a bit today,” he said, referring to the soybean and grains complex. Soybeans for December delivery climbed as high as $9.975 a bushel in after-hours electronic trading on the Chicago Board of Trade and last traded at $9.935 a bushel at 9:54 a.m. in Singapore. Soybeans for May delivery on the Dalian Commodity Exchange rallied as much as 2.6 percent to 3,722 yuan ($545) a metric ton, before trading at 3,708 yuan at 9:35 a.m. Singapore time. Pro Farmer, a marketing and information company, also forecast corn output in the world’s biggest grower and exporter will be 12.807 billion bushels, more than the 12.761 billion estimated by the U.S. Department of Agriculture on Aug. 12. The USDA’s next output estimate will be released Sept. 11. Corn for December delivery added as much as 1.7 percent to $3.3175 a bushel in Chicago, before trading at $3.2925 a bushel. Corn for delivery in May on the Dalian Commodity Exchange gained as much as 2.5 percent to 1,755 yuan a ton, before trading at 1,736 yuan at 10:25 a.m. Singapore time. “If a Sept. 25 frost ends the season, neither corn nor soybeans will reach these levels,” Pro Farmer said. “A two- week-late frost could pump up final yields.” Many farmers will begin harvesting next month. Ukraine, the world’s fourth-largest corn exporter, and Russia will have “major losses to corn,” because of prior hot, dry weather during this growing season, forecaster DTN Meteorlogix LLC said in a report Aug. 21. South and east Ukraine and South Russia will have “little rainfall” in the seven days from Aug. 21, it said. Wheat for December delivery added 0.7 percent to $4.905 a bushel. The contract dropped to $4.855 a bushel on Aug. 19, the lowest in more than eight months. FKLI Aug Futures contract fall 2 points lower to close at 1159.5 levels as compare to previous trading session to with a total of 4,462 lots traded in the market. FKLI was seen traded sideways as regional indices seen rebound on the 2nd trading session despite FKLI was plunge in the earlier trading sessions. 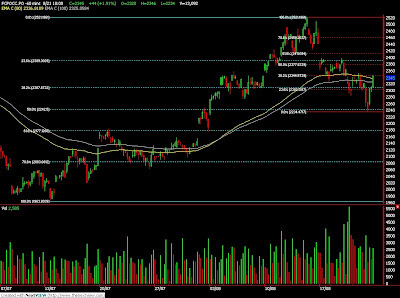 Technically, FKLI seem temporary supported around 78.6% Fibonacci retrace levels at 1152 regions. Based on our technical analyst, our opinion suggests FKLI would rebound towards resistance levels at 50% and 78.6% Fibonacci rebound levels at 1169 and 1180.5 regions. 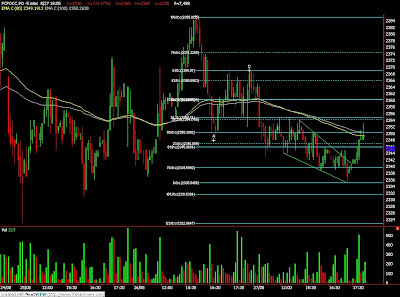 Traders were advice to hold short position provided resistance levels were not violated while be cautious around support levels at 1150 and 1140 regions. CPO 3rd month Nov futures contract close RM44 higher as compare to previous trading sessions to close at RM2345 with a total of 13,092 lots traded in the market. Wild trading days for CPO price trading judge based on the magnitude of the price traded despite not much of price movement from crude oil and soybean oil electronic trading. Technically, CPO manage to reach strong support at RM2242 level; 50% Fibonacci retrace levels and rebound strong to 38.1% Fibonacci rebound level at RM2340 regions. Based on our technical observations, it’s very likely uptrend was formed for CPO price trading with support levels at RM2242 must not be violated. However, traders were advice to hold long position on pull back as CPO price seen as overbought for short term trading with resistance levels at RM2380 and RM2460 levels.